Luxury hotels and resorts in Greece offer high quality services and can be compared to the best hotels in the world. Hotel groups, hotels and resorts and city hotels in Greece (Athens, Halkidiki, the Greek islands, etc.) are constantly renovated to meet the international quality standards and are located in enchanting areas providing tourists unique holidays. Make your reservations through our web site in the best luxury hotel groups, hotels and resorts in Greece and make your visit a unique travel experience! 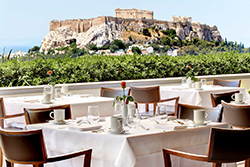 Luxury Hotels and resorts in Greece offer unique destinations and truly memorable stays. Irresistible, intriguing and indulgent range of escapes selectively located across Greece, - Athens, Crete, Corfu, Rhodes, Chalkidiki, Thessaloniki, the Greek islands, Kos, Santorini, Mykonos, the Cyclades, Dodecanese, Ionian Islands. 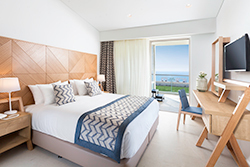 Luxury Hotels and resorts across Greece - Athens, Crete, Corfu, Rhodes, Chalkidiki, Thessaloniki, the Greek islands, Kos, Santorini, Mykonos, the Cyclades, Dodecanese, Ionian Islands - are exquisite properties ranging from country retreats to relaxing beachside resorts, each with its own individual charm and character. Unique destinations such as Athens, Crete, Corfu, Rhodes, Chalkidiki, Thessaloniki, the Greek islands, Kos, Santorini, Mykonos, the Cyclades, Dodecanese, Ionian Islands, with a plethora of hotels and resorts, luxury resort hotels, luxury spa hotels and city hotels, offer high-level hospitality and invite you to take advantage of a wide variety of alternative proposals for your holidays, owed to Greece's strategic location, ideal weather conditions and immense versatility of its natural environment. Luxury Hotels and resorts in Greece offer you top quality services and the opportunity for unforgettable holidays.